Cataract Surgery Post-Op Care: What Can I Expect After Surgery? The National Eye Institute (NEI) predicts that by the year 2050, 50.2 million Americans will develop cataracts. But don’t worry. Cataracts are a normal part of the aging process, currently affecting more than 22 million Americans age 40 and older, and half of all Americans over the age of 80, according to NEI. In a healthy eye, the lens focuses “light onto the retina for clear vision” and “adjusts the eye’s focus, letting us see things clearly both up close and far away,” explains Gretchyn Bailey, editor in chief of Optometry Times. Over time, proteins begin to build up in the lens, forming protein clumps, which can obscure normal vision. These clumps, or deposits, prevent light from passing clearly through the lens, causing images to appear cloudy or blurry, especially at night. Are Cataracts on the Rise among Young People? Is There a Link between Cataracts and Depression in Older Patients? It’s estimated more than 24 million Americans, age 40 and older, have cataracts, which can cause blurred or hazy vision, reduced intensity of colors, increased sensitivity to glare from lights, and difficulty driving at night. 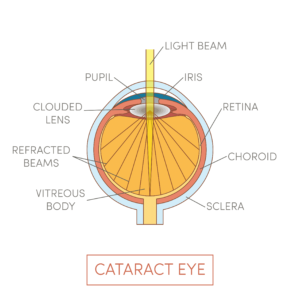 But what exactly is a cataract? Well, according to the American Optometric Association, “A cataract is a cloudy or opaque area in the normally clear lens of the eye,” which is located behind the iris, the colored part of the eye. Normally, the lens focuses light on the retina; however, as we grow older proteins begin to build up in the lens, forming protein clumps, which prevents light from passing clearly through the lens. This causes images to appear cloudy or blurry, especially at night. Most cataracts develop in people over age 55, but they can occasionally occur in younger adults and even children. But don’t worry; cataracts are very treatable. According to the National Eye Institute, “cataract surgery is one of the safest and most effective types of surgery performed in the United States today.” But what does it entail? When a cataract has progressed to the point that it is interfering with normal, everyday functions, such as driving or reading, surgery is often the recommended course of action. Cataract surgery involves moving the lens of the eye and replacing it with an artificial lens. Approximately 90 percent of cataract surgery patients report better vision following the surgery. 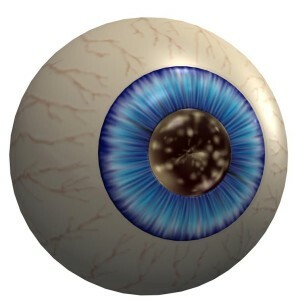 A Nuclear Cataract t is the most common type of cataract, beginning with a gradual hardening and yellowing of the central zone of the lens, also known as the nucleus. Over time, this hardening and yellowing will expand to the other layers of the lens. Nuclear cataracts typically develop as the result of aging. This is why a nuclear cataract is sometimes referred to as an age-related nuclear (ARN) cataract. A Cortical Cataract forms in the lens cortex and gradually extends its spokes from the outside of the lens to the center. There are two types of Subcapsular Cataract: posterior subcapsular cataracts and anterior subcapsular cataracts. These cataracts develop slowly at first, and then once they start, they may change rapidly. This is why regular eye exams are so important. Congenital Cataracts can be present at birth, or they can develop in early childhood. A Secondary Cataract forms after surgery for another eye problem, such as glaucoma. 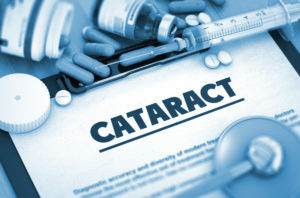 A Traumatic Cataract occurs as the result of trauma to the eye – blunt or penetrating ocular trauma, electric shock, chemical burns, or ionizing radiation. A traumatic cataract may present itself as an acute, subacute, or late sequela of ocular trauma. Radiation Cataracts develop as a result of exposure to – you guessed it – radiation. The Anne Arundel Eye Center, led by board certified ophthalmologist Dr. Samuel Boles, is a regional leader in the diagnosis and treatment of glaucoma and cataracts. Staffed by caring and knowledgeable professionals, AAEC’s state-of-the-art treatment center is dedicated to making the best eye care accessible to everyone.